Twitter, Facebook, Instagram, Pinterest, Email … the list goes on. There are so many channels to manage and keep track of these days, how do you do it? The key is to do less. Many marketers don’t know about Twitter cards because they are not heavily promoted. The Lead Generation card drives email sign-ups from your Twitter page. You can also add the card to an ongoing campaign to selectively target a particular demographic. You can either set these email addresses to automatically filter to your CRM or Marketing Automation System or manually download these addresses as a CSV. On the other hand, you can use your existing email contact list to build your Twitter following. Add your most engaged email recipients on Twitter and develop them into brand ambassadors. Or, try to engage less active email recipients on Twitter – perhaps they prefer this channel instead. To add a list, visit the Discover tab, you’ll find an option to “Find Friends”. Go to “manage the contacts” to manually add a CSV of your desired email contacts. Last but not least, if you haven’t done so already, remind email subscribers of your social media channels. You can build a dedicated email campaign promoting your social media channels and their added value. The Container Store did a great job in the example below. They kept the design simple and differentiated what each channel offers. Follow them on Twitter for updates and on Instagram for behind-the-scenes peeks. Use media monitoring tools like Mention and Buffer to stay up to date on what your users are talking about on social and how they are using your product. Don’t be afraid to go back to the basics and use Facebook’s Audience Insights and Twitter’s Analytics Manager as well. Facebook’s Audience Insights tells me that our primary Facebook audience is between 25-34 years old. Consumers ages 25 – 34 are more likely to access the Internet through their phones, so perhaps in their emails we add click-to-share buttons that allow them to easily share blog posts on Facebook. Not all customers are going to be equally engaged with your email content over time and that’s alright. Give them the freedom to choose how they hear from you and you’ll be rewarded with stronger brand loyalty. Build a preference center that allows customers to choose how often they receive email and what type of content they’ll see. While you may be initially concerned that you’re missing opportunity to communicate, remember that social media can make up for the gaps of silence. On both Facebook and Twitter, you can set up retargeting campaigns for subscribers that open or click-through. 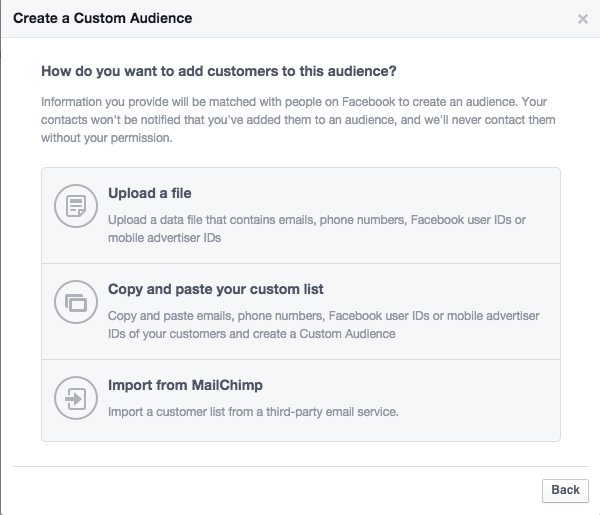 To set up your audience for your retargeting ad on Facebook, first visit your Ads Manager. Then, on the right-hand side toolbar, go to Audiences. Since you want to upload your own list of email contacts, go to “Create a Custom Audience”. Have your CSV contact list of choice ready on hand and either upload or copy and paste the list. Then, you can create the campaign accordingly. Remember that retargeting ads are most effective when keeping frequency in mind. Be sure to rotate out fresh creatives and content to prevent customer fatigue. In Twitter, you can do the same by visiting your Audience Manager. Select “Create A New Audience” and upload your own email list. Then, you’re given the option to name your audience. Be sure to be as descriptive as possible, since you will ideally update and segment your email contact list on a regular basis. What are some ways you integrate your email and social media marketing strategies? This post was first published as a lesson on FrontApp’s CommunicateBetter.io course. Business trends don’t escape this phenomenon. The explosion of the online world at the beginning of the 20th century turned once intimate relationships of small businesses into a more scalable one-to-many relationship. Many hours of face time were traded in for a few clicks of the mouse. Now, a few years later, we’ve realized how much more impactful it is to get to know your customers on a first name basis. Customers are armed with more information than ever and an overwhelming number of digital tools to help inform their purchase decisions. The only way to cut through the noise of the digital space is to deliver, to be relevant and informative. In this week’s CommunicateBetter.io lesson, I’ll discuss a few reasons why you should hop back on the bandwagon of communicating like a mom-and-pop shop. Personalization is Everywhere (and more important than ever) Technology has made it increasingly easy to track online activity, identify habits and interests, and deliver customized content. Because of this, personalization has become the norm. Consumers have seen the “first-name-in-the-subject-line” trick in emails many times over and retargeting ads are no longer a surprise. In this day and age, consumers expect a whole lot more than you knowing their name. They expect a true, gimmick-free, one-to-one, personalized experience at every customer touchpoint. Every touchpoint customers have with your company should influence their future experiences with you. Track the data along the way, and you can tailor every future interaction specifically for them. It builds trust – 83% of consumers name “transparent and honest practices” as the most important factor in establishing brand trust, and 77% of online shoppers say they’re more likely to buy from a retailer when emails are personal (Harris Interactive, 2010). It boosts conversion rates – In a study run by Adobe, companies reported that using personalization resulted in conversion rates 1.7 times the rate of generic content. Just as impressive, HubSpot looked at their data over a 12 month period and found that CTAs targeted to the user had a 42% higher view-to-submission rate. Now that we understand why personalization is such an important tactic, let’s look at specific ways we can leverage it in communicating with customers. The number one rule in personalization is to be relevant. There’s nothing worse than to prompt your customer with one call-to-action but link to a generic homepage promoting an entirely different message. It’s a leaky funnel – The homepage is full of distractions – there are typically a variety of call-to-actions and links that can take visitors down conversion funnels that do not match their intent. Message match – Visitors land on your homepage expecting one message but are more likely to see a different message. Give visitors the information they are looking for by directing them to dedicated landing pages tailored specifically to them. It will lower your bounce rate, and more importantly boost conversions. Beyond personalizing to what you are saying in your ads, also personalize by who the audience is. For instance, when you write a guest blog post for another company, don’t make the link in your author bio be your homepage. Create a landing page with messaging that speaks directly to the audience of that blog and share a link to that. If your landing pages are focused enough, you may even drive organic search traffic. In other words, targeted visitors looking for exactly what you are offering. Key Takeaway: People visit your website to learn how your product can help them specifically. Don’t dump them into a generic experience and make them search for it. The effectiveness of using someone’s first name in email subject lines has been widely debated. According to a MarketingSherpa study, using a customer’s first name in a subject line can result in a 17.36% higher than average click-through rate. While, a study by ReturnPath suggests that this kind of personalization can hurt email deliverability. My advice? Run an A/B test to see how it performs for your specific business. And, don’t stop there. Try acknowledging the person you are talking to throughout your customer’s experience with your business. Within the content of the email (not just in the subject), as a greeting when users log in to your site, etc. To further establish and reinforce a personal relationship with your customers, use your name as well! Instead of your “From” name in your emails being your company, include a real person’s name. Which are you more likely to hit “Reply” to? A faceless company, or a real person ready to answer your questions? Geckoboard goes a bit further by including an image of the sender at the bottom of their emails to add even more of a personal touch. You can do this on Twitter as well. When you respond to incoming support requests, feedback and other mentions on Twitter, include your initials (like so “^DC”) at the end of the Tweet so that they know they’re being heard by a real person on the other side of the screen. Key Takeaway: Find opportunities to show customers that they are being heard by real people, and that you want to establish a one-to-one relationship with them. Communicating with names is a good start. According to a 2014 DMA study, a 760% increase in email revenue came from segmented emails in 2013. Sorting customers into segmented lists makes it easier to personalize communication with a few clicks of the mouse. Location – Send an email about snow shovels to customers living in the Northeast right before a big blizzard. Age – Consumers ages 25 – 34 are more likely to access the internet through their phone. Email customers ages 25 – 34 with special mobile content. Interest – Segment out customers interested in running to send them an email promotion on running shoes. Product Usage – Email a customer who regularly uses your product and invite them to help promote your product on social media by Liking your Facebook page or tweeting about his/her experience. And it saves time because you will have saved segments that allow you to email individual lists or mix and match to target more niche audiences, instead of pulling new lists each time you create a new campaign. Key Takeaway: Organize your customer data into segmented lists to send the right content to the right people in half the time. Aim to create a seamless and continuously relevant customer experience. This again, makes customers feel as if they are interacting with people that listen and care about them, instead of a faceless corporation. Netflix is a company that has this process locked down. 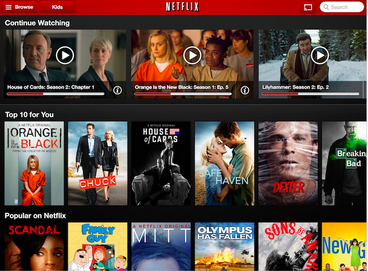 The top of your login screen shows all of the shows you have in progress – simply click to resume. In an era where customers make split second buying decisions with the click of a mouse, gimmick-free personalization has to count. The less interruption in the user experience or buying process, the better. To this point, customers expect companies to know who they are and how they have engaged in the past. A universally well-executed example of this is pizza shops. If you eat a lot of pizza (like me) you’ll know that as a repeat customer they have your number saved on caller id, and will easily list your preferred pizza toppings and address before you even start your order. Gilt is another company that uses “carried-context” well. They remind users of their account credits prominently in their website header, so you’re incentivized to purchase when you see the remaining credits just sitting there in your account. This is helpful information to Gilt users, but likely also results in increased sales for Gilt. Key Takeaway: Don’t make customers feel like a stranger every time they use your service. Customers today expect you to know their habits and preferences and to adapt to them. Be one step ahead of the customer by always knowing what the next best action is for them to get the most out of your product or service. At Mailjet, we use whitepaper downloads as an opportunity to capture email sign-ups for our newsletter. Our bi-weekly newsletter is an additional platform used to drive traffic back to our blog. Both educate current customers on better sending and encourage trial signup (the next step). Once customers are signed up, what’s the next best thing your customers can do to gain value from your service? Most likely… use it! At this stage, promote content that will help them do that better, based on their behavior so far. And don’t be limited by online interactions. When you see an opportunity to introduce a customer to the ‘next step’ in the customer lifecycle, pick up the phone and call them! They will value the personal touch and the fact that you are calling to provide true value (and not just upsell them). Key Takeaway: Always be one step ahead of your customers – keep providing ways for them to get the most out of your product. In short, always put the customer first when creating content. Collect data at every point of interaction, get to know your customer and focus on how you can help deliver more value. This open feedback loop will create happier customers and ultimately, a better product. So don’t hesitate to hop back onto the trend of communicating like a mom-and-pop shop. Afterall, all the cool brands are doing it.